Based on the idea of classical family portraits the [SSEXBBOX] team is looking to put together an international photo series that highlights the new evolutionary paradigm of relationship dynamics. We would like you and your "family" to take a photograph and briefly explain to us how y'all relate to one another. Need more inspiration? Think American Gothic, traditional wedding photographs, family reunion photographs, quinceanera photographs, Paris is Burning: House of Xtravaganza and House of Ninja, Flintstones meet the Jetsons, and the Cosbys in a blender with a splash of queer fairy energy, ice, and a dash of creativity. Submitted photographs must be 300dpi and should be accompanied by a brief description of 30 words or less. Submissions and questions can be sent to magazine [at] ssexbbox [dot] com. The deadline is August 15, 2011. 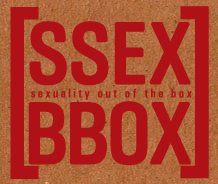 [SSEXBBOX] can also be found on Facebook and Twitter.